Amoxicillin For Sale One Day Sale » Blog Archive » 2018 Kia Rio EX 5 Door: Suuuurprise! 2018 Kia Rio EX 5 Door: Suuuurprise! By Don Hammonds We all know the story. Subcompact cars are ugly. They are no fun to drive. They're slow. The interior is a prison sentence. Well, Kia's all-new 2018 Rio EX Five Door just took that story and tore it to shreds--and it's one of this year's biggest automotive surprises. The Rio is an absolute blast to drive, and corners quite aggressively too. Who knew? Way more fun to drive than just about any of its competitors in this market segment. It is powered by a 1.6 liter four cylinder engine, backed by a six speed transmission. Kudos here too. The overall rating is 28 city, 37 highway, and 32 miles per gallon overall. The car uses 3.1 gallons of gasoline per 100 miles, and you save over $1,250 in fuel costs over five years. The annual fuel cost is $1,100, based on 15,000 miles per year. When you consider what a little rocket this car is on the road, isn't it wonderful to know you won't need to use tons of gasoline to have so much fun? Secondly, look at the price on the Monroney--$20,225---and then let your eyeballs take in that equipment list. The list of standard equipment on the Rio EX 5Door is absolutely astonishing: Air, power windows, door locks and outside mirrors, AM/FM/MP3 system with seven inch touchscreen and rear camera; UVO e Services Infotainment system, Android Auto & Apple CarPlay Smartphone integration; Sirius XM with a free three month subscription; Bluetooth; tricoat cloth seat trim; 60/40 split rear folding seats; remote keyless entry; tilt and telescopic steering column; leather wrapped steering wheel and gearshift knob; steering wheel controls; supervision meter cluster with LCD Display; autonomous Emergency Braking system; forward collision warning system; dual illuminated visor vanity mirrors; fog lights and multi reflector headlights, heated outside mirrors and a rear spoiler with rear wiper and washer! There's a lot of standard features included, too: Dual front advanced airbags; front seat mounted side airbags, full length side curtain airbags, antilock brakes, traction control, electronic stability control, Vehicle Stability Management; Hill-start assist control, tire pressure monitoring system and other related items. Now consider that this price includes a red accent leather seat and interior trim package! ALL for $20,225! It would be one thing if you got all this and the car was so-so. But not the Rio. It's a really terrific car--with one heck of a lot of value. This is one car that has come a long, long way in such a short time. It's all new for 2018, and that's an understatement. Quality had been going up for some time on the Rio, but with this latest version, it really has skyrocketed, the fit and finish is really top notch, and the interior presentation looks to be several notches above it competitors, and really compares in appearance and finish to upscale intermediate family sedans. And of course, its easy as butter to drive on the road, given its size and its agility. Kia's paid a lot of attention to the styling as well. It's much more rounded and flowing, with little hint of the three box school of design that prevails in this market segment. Quite classy, yet sporty looking. Inside, we were really impressed by how the Rio feels at interior touch points such as the armrest,, controls, and the top of the dash. Nothing was overlooked. Nothing looks cheap. Then of course, there's that famous warranty that graces every Kia: 10 year/100,000 mile limited powertrain warranty; 5 year/60,000 mile limited basic warranty; and 5 year,60,000 mile Roadside Assistance package. But as we said before, the biggest proof for us was the driving. 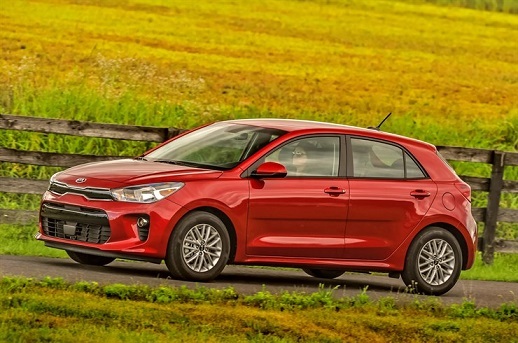 It corners beautifully, has excellent steering and brakes as you sit in some of the most comfortable seats in the subcompact car field. Faults? Couldn't find a one. The Rio has outdone itself in this latest generation version, and shouldered its way into position as one of the best automotive buys around in its market segment.